Today we’re announcing that we’ve acquired Drip. Drip is a world-class marketing automation and email platform. 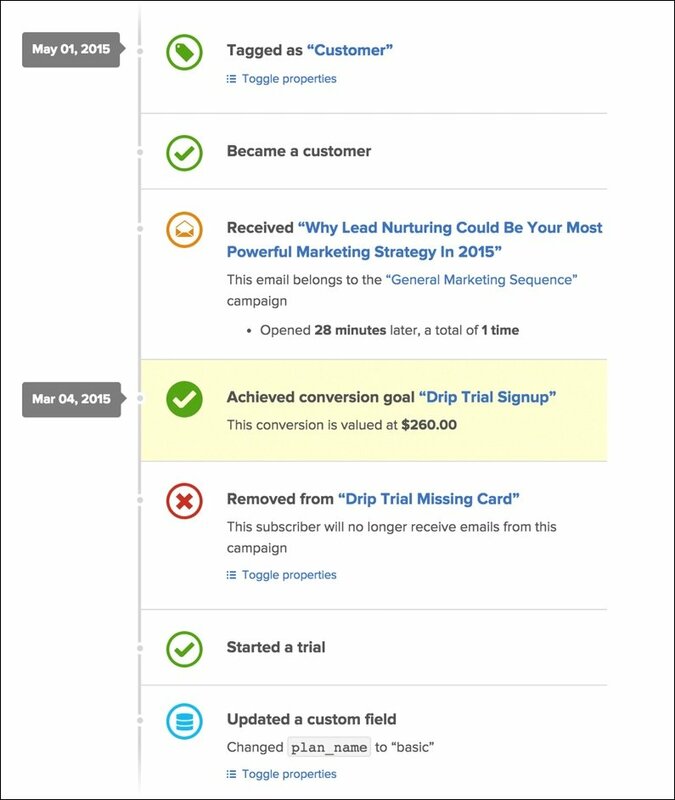 OK, so I’m admittedly marketing here, but if you’re interested in taking your marketing automation and funnels to the next level, I’d encourage you to try Drip free for 21 days. Here’s Drip’s feature list, and here’s where you can sign up for a 21-day trial. 2. Drip is a world-class, feature-rich marketing automation and email platform in the same vein as InfusionSoft and HubSpot. It’s our favorite email service provider with our favorite visual campaign builder. In terms of feature set, integrations, lead scoring, etc., we think Drip can go head to head with anyone (including publicly traded companies in the marketing automation space). Especially when you consider its UI and simplicity. Right now our marketing team is moving from HubSpot to Drip to take advantage of its visual workflows and funnels. Visual Workflows: Apply tags, send one-off emails or entire campaign sequences, wait for two days until the following Tuesday at 11am, branch with if/then logic, and do about 30 other things … all defined visually and powered by Drip’s automation engine. 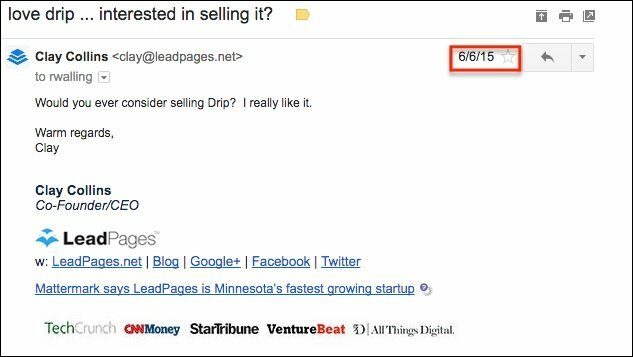 Lead Scoring (to Identify Your Best Leads): Drip’s lead scoring algorithm tracks a number of events to determine which subscribers are most engaged with your content and likely to become customers. You can easily sort and filter contacts by lead score to focus your efforts on your most engaged subscribers. Rule-Based Tagging and Segments: You can use Drip’s automation engine to apply tags to your subscribers when they perform particular actions, such as visiting a page on your website, clicking a link in an email, making a purchase, or any other custom event you define. Drip also supports unlimited custom fields, so you can collect and act on any kind of information you need to know. Lots of Triggers and Actions: Drip’s rule builder includes 11 kinds of triggers and 14 potential actions. 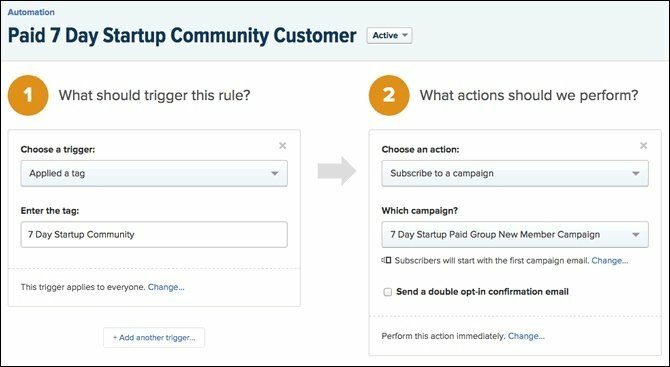 Automations can be used to move subscribers in and out of campaigns, apply tags, record conversions, send them to another application (such as your CRM), and more. Triggers Events Based on Pageviews: Drip can track which pages of your site contacts have visited. Want to send an email to everyone who visits your pricing page? With a simple rule in Drip, you can do this automatically. Deep Analytics: Drip automatically tracks subscriber activity on your site (and in your app, if you have one), along with key performance metrics for opt-in forms and campaigns. Lots of Integrations: Drip natively integrates with dozens of applications and platforms: landing page providers (including Leadpages, of course), payment gateways, shopping carts, CRM platforms, and more. 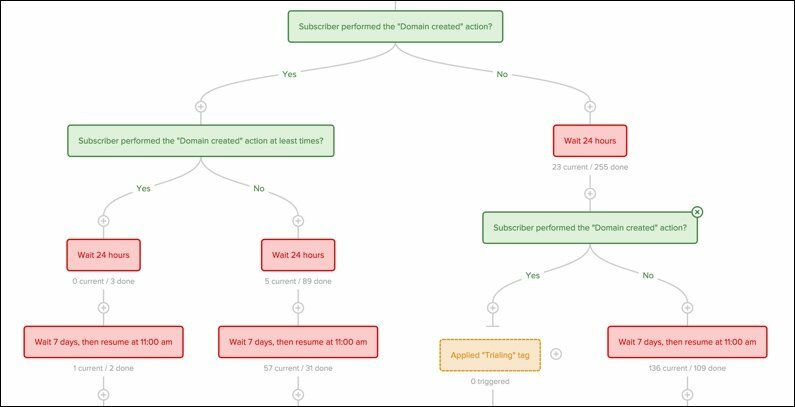 Subscriber Pruning: You can easily tell Drip to regularly remove subscribers who are no longer engaging with your emails, which keeps your costs down and your list quality high. 3. Drip has some really cool customers and fans (and that’s a huge part of what made them attractive to us). Note: This is from the CEO of Ambassador (which is part of our Arthur Ventures family) to the CEO of Help Scout (which is part of the Foundry Group family). And articles like this from Dan Norris showed us the real value of this platform. It’s also been great seeing Drip listed as the preferred automation provider of respected sites like GrowHack.com. 4. This deal has been in the making for over a year now (and meanwhile, Drip more than doubled in size as a business). Here’s my first email to Rob over a year ago. Since sending that email, I’ve discovered that Rob and Derrick are not only great product people and visionaries, but they’re also really kind, generous, and thoughtful people. The kind of people I would work for. 5. Leadpages will continue to enthusiastically add integrations with Drip competitors. We believe that the days of “one marketing suite to rule them all” are over. We believe that a customer’s decision to buy one of our products shouldn’t lock them into all of our products. We believe that our customers should be able to use Leadpages with whatever email service provider, marketing automation platform, or CRM they choose. 6. 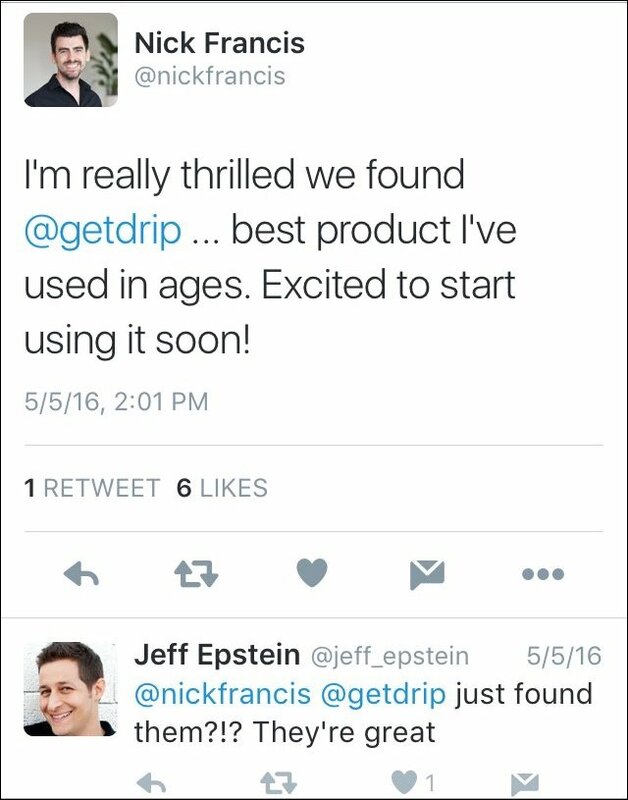 Drip will continue to enthusiastically integrate with Leadpages competitors. Please see above. If you have a landing page or forms solution and want Drip to integrate with you, please let me know on Twitter (@claycollins) and we’ll do our best to make it happen. The entire Drip team has joined Leadpages while maintaining its current reporting structure. And I’m excited to announce that the cofounders will be moving to Minneapolis, along with several other members of the Drip team. We’re in this for the long haul, and this won’t be a win unless both Drip and Leadpages customers consider it one. That’s why we love them. Drip has magic. And if we killed any of that magic, this acquisition would be a failure. If you’re a Drip customer, I believe you’ll see just one main difference post-acquisition: Rob and Derrick will have more resources to scale their vision. 8. I’m going to try and convince Rob to speak at Converted this year. Rob, if you’re reading this, any chance you can speak on October 18–19 here in Minneapolis? P.S. You (the reader) should totally come this year. It’s going to be awesome. 9. We’ve got lots planned for Drip’s future roadmap. Lots. I cannot believe what they’ve built with 7 employees. We’re just getting started. To stay in the loop, be sure to go here and get on Drip’s newsletter. I could say we’re making a huge bet on Drip. It is huge. But it doesn’t feel like a bet at all. We’re incredibly confident in their future—and we’re excited to start using Drip in our day-to-day work. We hope you will be, too. As always, our team and I will be in the comments section if you have any questions.